Series Galaxy Note phablet started booming market, whose size gadget is a combination of smartphones and tablet PCs. 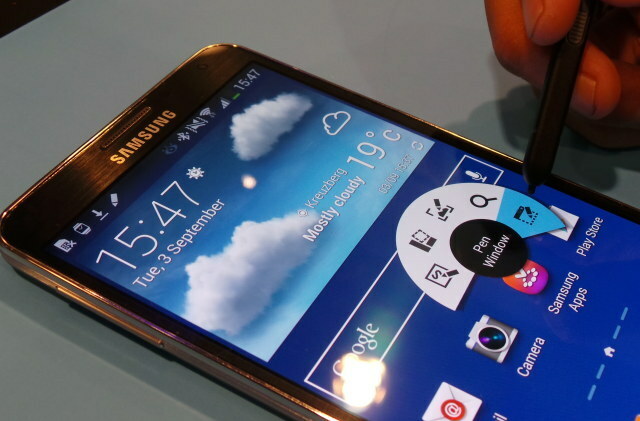 Now, the third generation, the Galaxy Note 3 Samsung announced in Berlin, Germany. As the hero handsets in addition to the Galaxy S4, Galaxy Note 3 equipped with many excellent features. Differentiation is needed in the middle of a flood shall phablet products from competitors. Like what capabilities the Galaxy Note 3? Here`s a brief hands on time performance test Samsung`s flagship phablet. There is no radical change in a matter of design than the Galaxy Note 3 Samsung Galaxy Note 2. Both are identical although of course there are some touch of distinction. Although the size of the screen is a bit wider than its predecessor, the Galaxy Note 3 is designed to be thinner and lighter. This makes it quite comfortable in the hand, although sometimes a hassle because of the size of the. So it seems to feel more secure and comfortable when used with both hands. What is interesting is the rear casing material in a more premium than ever before. Looks like textured skin even when touched, the material is likely a mixture of plastic with rubber. Overall, the design is quite interesting Note 3 although no significant breakthrough. Samsung retains the hallmark of design in this new phablet. Screen Galaxy Note 3 provides a clear view. Indeed, he was supported by a resolution FHD (full high definition) 1920 x 1080 pixels. With Samsung`s unique Super AMOLED technology, the colors of the display looks sharp. The 5.7 inch width, making Note 3 looks bongsor. The operating system is Android Jelly Bean carries. As usual, there are some interface customization done Samsung, which sets it apart from Android phones made by competitors. Interesting difference is the look of the homescreen can be changed drastically. That is in my view the so-called magazine. Enough finger swipe upwards from the bottom of the screen, the display turns into a grid that can be varied as desired content. Quite interesting although not an original concept. When it comes to specs, Note 3 is arguably the hero. As already mentioned, the handset relies quad core 2.3 GHz processor backed with 3 GB RAM. Fierce specs on paper that is able to translate well when operating the handset. Everything was smooth without the annoying lag symptoms. Access applications or switching between screen smoothly without any problems. Similarly, when doing multitasking. In short, the Galaxy Note 3 has the potential to become one of the fastest Android handset on the market performance. And what about the battery life considering the specifications gahar Galaxy Note 3? The handset is equipped with a 3,200 mAh battery. According to Samsung, the new generation of processors used Galaxy Note 3 is also more power efficient than ever before. Is it true that more testing needs. 13-megapixel resolution camera means the Galaxy Note 3 to take photos and video. At this time it is not special enough to remember too many competitors rely on the camera with the same resolution. Jepretannya results seem reliable. For low light conditions, the flash light is provided to assist illumination. But as smartphone cameras in general, photos indoors is not guaranteed to be always satisfactory. Sometimes there is the potential for blur or obscure. While outdoor trials have not been performed. But it seems quite reliable considering the high resolution. With the provision of high specifications as well as the enhanced ability stylus, the Galaxy Note 3 is able to bring a little more differentiation than similar products of rivals. Clarity of the screen and speedy performance will likely satisfy fans. Plus more great stylus function and is beneficial, making the Galaxy Note III has more value. Criticism may come about the lack of breakthrough features that can actually declared a major breakthrough. Likewise, the design has not changed much, though from the side it looks more premium materials. With all its pros and cons, Galaxy Note 3 seems to deserve a choice for those who want to propose a phablet. If the price is right, it is not impossible this handset will ngehits.